Can anyone tell me what currency this is? I think it's Japanese but I'm not sure from when or even where. Someone in my family brought it back from the service. This is a Taiwanese bankote with a face value of TWD $10. It depicts Dr Sun Yat-sen with the Presidential Office in Taipei on the reverse. The text says "Bank of Taiwan", the issuing authority, and "Year 59 of the Republic", i.e. 1960 in the Common Era. This date identifies when the printing plates were designed, not when the specific note was printed or issued. Which means it was part of the first issue of the horizontal series. 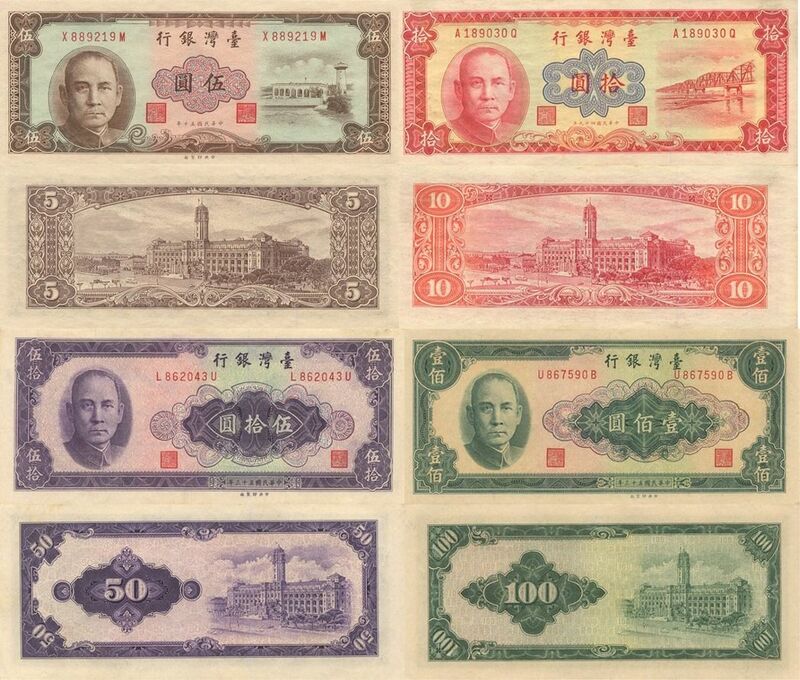 Prior to it, Taiwanese banknotes were vertical. There were two versions of the $10 note in the first series, one in red as in the question, and the other in dark blue. The image shown in @JMS's answer is the latter. Both versions were printed using the same plates, but in different facilities and issued in different years. 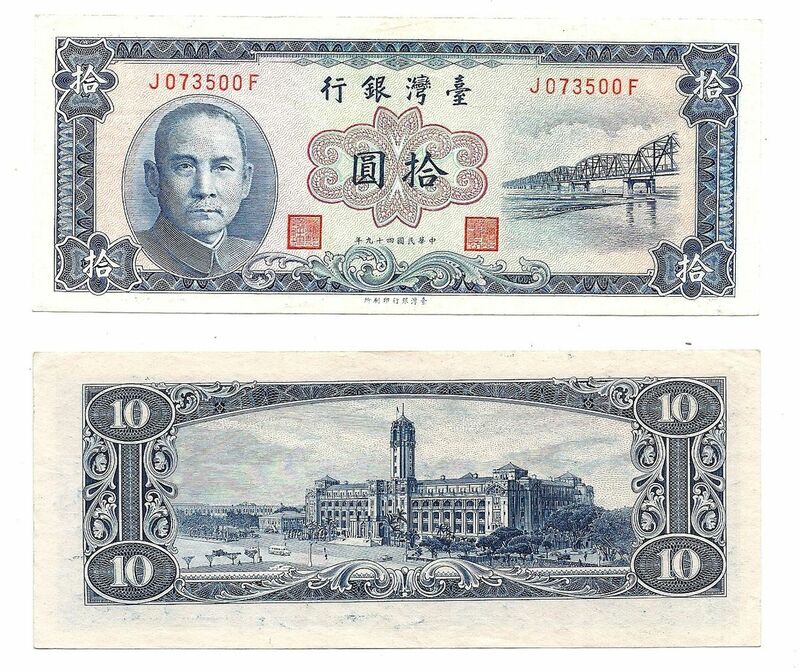 The blue version was printed by the Bank of Taiwan's Printing Bureau, and first issued on 14 January, 1963. The red version was printed by the Central Engraving and Printing Plant, which was operated by Taiwan's Central Bank. This version was released into general circulation only from 1 August, 1968. From left to right and top to bottom: $5, $10, $50, $100. Looks like Semaphore just beat me to it. I found it by googling who uses kanji characters. Then searching on cropped parts of the images (the portrait and bridge and kanji characters) , with "10" and interchanging country names like Japan, Thailand, Vietnam, Malaysia, China, Hong Kong and finally Taiwan. Took about 20 minutes. Found the 10 yen note from Taiwan currency circa 1960 with Dr Sun Yat-sen, born 1866 Xiangshan, Guangdong, from China, Portrait from 1925 Beijing. Not the answer you're looking for? Browse other questions tagged identification currency or ask your own question. What time period did these notes come from? What was the first electronic creation of money? Does anyone know what this set of aviation wings represent?